I’m always in a specific predicament — figuring out what to do with bananas that are about to go bad. My kids never eat them fast enough, and before you know it, the bananas are more brown than yellow. So I’m always game to finding new ways to use them before I lose them. One way I use them is in smoothies. Lately I’ve been reading about oatmeal smoothies, and thought I’d try one out, thinking it would be a nice balanced breakfast alternative. With protein, fruit, calcium, and carbs, this is a pretty well-rounded smoothie, if I do say so myself. It’s not super-sweet, but then again, it shouldn’t be. And it does have a texture to it. I have a Ninja blender and mine came out pretty smooth, but it does still definitely have some “meat” to it with drinkable small pieces of oats and almonds. A 12-oz serving is a perfect breakfast or snack, and a healthy alternative to all that processed gluten-free cereal. And this one is sure to help stave off the cravings! This one is pretty easy. Throw it all in a blender and blend until smooth! 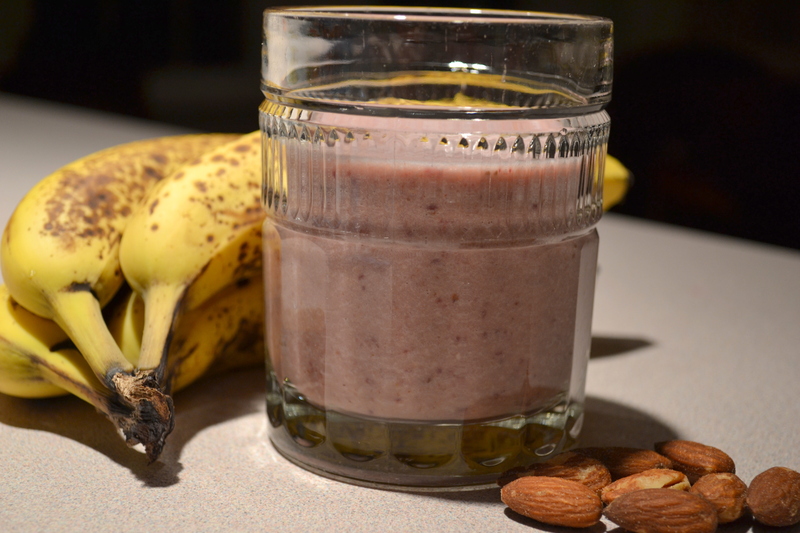 Try different combinations to find an oatmeal smoothie that will fill you up! P.S. Peel and freeze your “almost bad” bananas for future smoothies! It’s been a good 2 weeks since I last posted. We flew our family back to Baltimore to spend Christmas at my parents’ house. It was so nice to see the joy on my parents’ faces as we brought together all their children and grandchildren for Christmas dinner. It’s been a long time since we were all home at Christmas and my mother always does such a fantastic job at making the house feel magical. Beautiful Christmas morning sunrise over my parents’ fields. Unfortunately, it wouldn’t be Christmas without someone getting sick, and that someone was me. I came down with what I thought was a really bad cold, and then proceeded to pass it Patrick, Sophia, and both my parents. What a nice Christmas present that was to everyone! Turns out it was a version of the flu that wasn’t covered by the flu shot. Here’s my public apology — I’m sorry! After recovering from the flu and a fantastic New Year’s Eve celebration at our neighbors’ house, I was ready to get back in the kitchen on New Year’s Day. Outside was blanketed in snow and bitter cold winds, so I decided to stay indoors and make banana bread. Wanting something on the lighter side, I found a recipe in the 2010 edition of “Light and Healthy”, from America’s Test Kitchen and the editors of Cook’s Illustrated. This recipe called for roasting the bananas, which was a new cooking technique for me and was great fun! Heat oven to 325°F with rack in the middle. Spray bread loaf pan with non-stick spray and set aside. Bake bananas directly on the oven rack for about 20 minutes or until skins turn black. Let bananas cool to room temperature. Leave the oven on at 325°F. Use this time to start your flour mixture. In a small bowl, whisk together eggs and vanilla and set aside. Using a standing mixer or hand mixer, combine flour, 1/2 cup sugar, baking powder, baking soda, and salt. Mix until blended. Add the oil and Tofutti. Note: I wanted to make this bread dairy-free, so I used my non-dairy cream cheese preference — Tofutti Better than Cream cheese, which worked great. If you have no dairy restrictions, regular or fat-free cream cheese works equally well. Add the cream cheese, one piece at a time and mix on slow speed until cream cheese pieces are pea-sized. Then slowly add in the egg mixture. Now, cut the tops off your bananas and squeeze into a small bowl, and mash. Note: This was the first time I’ve ever roasted bananas. The original recipe doesn’t say anything about the water content produced through roasting. I was thinking to myself that the flour mixture looked too thick, but when peeled the bananas, I realized there was a lot of water content from the bananas, and this helped to bring the bread dough to the right consistency. On low speed, mix the mashed bananas and banana-water into the flour mixture until just blended or about 30 seconds. In another small bowl, combine 1/8 cup of sugar and 1/2 tsp cinnamon. Pour half the bread dough mixture into your bread pan. Sprinkle with cinnamon sugar, and pour the remaining bread dough on top and smooth out with a spatula. Bake for 50 minutes or until a toothpick comes out clean. Allow bread to rest in pan for 5 minutes, then transfer to a cooling rack.